Seems Avril Lavigne’s Forbidden Rose was borrowing from Rosewood’s style of fragrance naming as there is no rosewood to be had in this scent. What there is, however, is a very nice sweet woodsy fragrance. In Bottle: Warm, sweet and sandalwood. There’s a sugary vanilla in this but it’s not overdone like some fragrances and actually blends really well with the sandalwood. Applied: Sweet and warm sandalwood. Smells very comforting. I want to believe there’s a floral note somewhere in here but if there is, it’s very sheer. Rosewood, is lacking the note from which it draws its name but it’s a very pleasant and wearable woodsy fragrance. The sandalwood is comforting. The vanilla and amber makes this approachable and the scent as a whole smells soft and gentle and clean. I get the occasional kick of warmed spices here and there that my brain wants to associate with cinnamon but Rosewood is predominantly a two-trick pony. Warm amber and vanilla on one end and sandalwood on the other. Into the mid-stage is pretty much the same deal with the sweet sandalwood and the dry down gives us a more comprehensive sniff of the amber but by and large, Rosewood is one-dimensional. And hey, it works because I think this is a great scent for work that’s graduated a few levels above your typical easy to wear fruity floral. Extra: Funny thing to note is Banana Republic selling this fragrance as a floral oriental when there’s barely any florals in here to trace. An oriental? Okay, I’ll give it that. Rosewood has actually polarized a portion of the fragrance lover community that those who hate it feel misled by the name and those who love it just like its clean simplicity. Design: The bottle itself is an ugly thing to behold. It’s a very squat, rounded shape built out of muddy glass that feels a bit lumpy when held. The sprayer nozzle works just fine but the shape and how wide this bottle is makes it hard to hold for spraying. The metallic cap has a leathery-material as a band around it. I like the metal cap, I could do without the leathery-thing. The one good thing I can say about Rosewood’s packaging is the cylindrical wooden container it comes in. It looks nice in a way. The lid is magnetized and it does a great job at hiding the rather hideous bottle. I only wish the thing was more reusable but Rosewood’s bottle is a pretty specialized shape so just about the only thing the wooden container can hold after you’re done with the fragrance is the original bottle or something equally squat. I’m thinking my sample size perfumes are going in this thing when I’m all done with Rosewood. Notes: Bergamot, champagne, white tea leaves, and white amber. That notes list is pretty much bunk as it’s missing a great deal of what, I assume, is actually in this fragrance. There’s a spice note to be sure, and sandalwood, and something more than just amber. Which I suspected is vanilla. 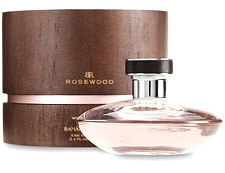 Reviewed in This Post: Rosewood, 2009, Eau de Parfum. This entry was posted in banana republic, oriental, Reviews By House, sweet, woodsy and tagged amber, bergamot, champagne, sandalwood, spice, vanilla, white tea leaves. Bookmark the permalink. I have not tried any of banana republic’s perfumes. You described it very well and it sounds like it is worth a try. I like the description of the bottle as an ugly thing to behold. haha. Hi, This is a great description of one of my favorite perfumes. I have heard it has been discontinued (2011). Do you have any idea what perfumes may be similar in smell to this one (that are still on the market?). Thanks! Ah, I have not heard of any plans to discontinue Rosewood. It would be a shame if they did. Though last time I was in a Banana Republic, they still had Rosewood on their shelves. Maybe it’s just a temporary lapse in supply and not a full out discontinuation?